FileFactory is a file sharing network based in Hong Kong. File sharing includes uploading music, images, videos, PDF files, doc files and many more. The revenue models of this network are PPS and PPD. Launched in 2005 this file sharing network is offering unlimited free file hosting. It means that this file sharing network offers unlimited bandwidth, unlimited uploads, unlimited downloads and unlimited storage to users. There are 2 plans for users : 1. Free and 2. Premium. There are few limitations for using free account like 90 days storage. Where as in premium plan you can store your files for lifetime with unlimited offers. FileFactory is offering a great opportunity for affiliates to make money referring premium users. The best part is you get approval instantly. You don’t need to wait for the review process. You can straightaway start promoting FileFactory using promotional tools like banners, E-Mail, buttons and referral link . So once you refer premium users you keep getting commissions. 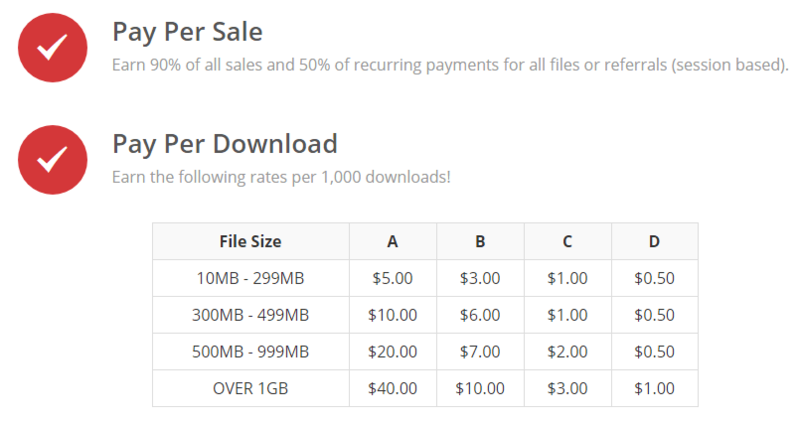 This file sharing platform is currently offering 2 types of programs : Pay Per Sale Program and Pay Per Download Program. Being an affiliate you can either select one or use both of them to promote. The affiliates would get paid on request basis. The payment options are Payza and Amazon Gift Card. The minimum payout is $100. FileFactory network is a great source of monetization for affiliates. The affiliates who had tried this file sharing platform can share their experiences below. You can also send payment proof here. Hope this FileFactory affiliate program review help affiliates to get started.